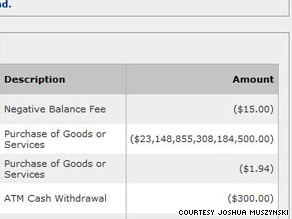 Card issuer strikes charge and fee, blames "temporary programming error"
That's about 2,007 times the size of the national debt. Muszynski wondered aloud what he might possibly have asked to purchase for such an astronomical price. "Can I buy Europe on pump 4?" He next called Bank of America, the issuer of his Visa prepaid debit card. The bank kept him on hold for two hours, during which time he contemplated the impossibly bleak financial future that might await him. He also felt a stab of fear that he had saddled all his unborn grandchildren -- and their grandchildren -- with a lifetime of debt. "Down the generational line, nobody would have any money." Finally, a bank representative told him that the $23 quadrillion charge -- and the $15 overdraft fee -- would be stricken from his account. Muszynski compared the giant debt reprieve to receiving "an amazing Monopoly card that says, 'Bank error in your favor.' "
In a statement, Visa said the rogue charges affected "fewer than 13,000 prepaid transactions" and resulted from a "temporary programming error at Visa Debit Processing Services ... [which] caused some transactions to be inaccurately posted to a small number of Visa prepaid accounts." The company assured customers that the problem has been fixed and that all falsely issued fees have been voided. "Erroneous postings have been removed ... this incident had no financial impact on Visa prepaid cardholders." All About Bank of America Corporation • Visa Inc.